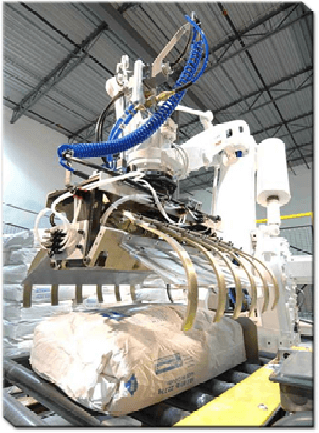 Kraken Automation employs a comprehensive range of robotic systems, solutions, and integration services into your robotic palletizer or robotic depalletizer solutions. Our palletizing systems incorporate any one of a variety of industry-leading robots sourced from top manufacturers like ABB, GE, Fanuc, Motomann, and others, equipped with end effectors most suited to the requirements of your particular application. Also included in our solutions line-up are industrial robotic systems intended for heavy-duty pick-and-place or palletizing system operations. These robotic palletizers – or conversely, robotic depalletizers – can handle a variety of payload, reach, and axis requirements and are available in optional floor, wall-mounted, or suspended versions depending upon your space availability for system footprint. Kraken can upgrade your existing system with retrofitted controls, or provide new controls for a fully automated, easy-to-use robotic depalletizer or palletizer.